The Croft Port house was established in 1588 and is the oldest firm operating in Oporto today. The company is renowned for its range of Port styles; vintage, wood aged reserves and tawnies. The 10 Year Old Tawny is crafted from wines that have matured for an average of 10 years in 630 litre seasoned oak casks. During the long ageing process the fortified wine’s colour fades to a tawny hue, the tannins soften and it acquires complex aromas and flavours from oak as well as oxidative notes. 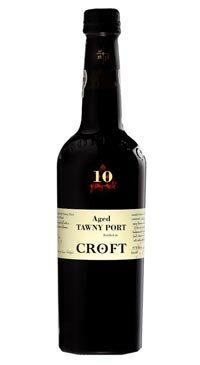 This Port is bottled and ready for drinking upon release as it is already a very developed and layered fortified wine. The nose is complex and spicy with aromas of toasted walnuts and butterscotch while rich ripe fruit comes through in the background. The palate is smooth and round with flavours of dried figs and caramel.